A scheme highlighting businesses which have made genuine cuts in emissions is being launched to rebuild public trust in the green claims made by firms. 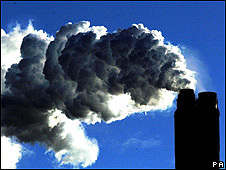 The Carbon Trust says its standard will only be issued to UK organisations that show "real reductions year-on-year". Companies that paid a third party to offset emissions on their behalf would not qualify, the Trust added. Last year, ministers voiced concern about the lack of consistency between a number of private offsetting schemes. Tom Delay, chief executive of the Carbon Trust, said the new benchmark was in response to the public's growing mistrust of companies' claims to be cutting their greenhouse gas emissions. "What businesses and consumers both share is a desire for one, credible way to prove that an organisation has not only measured, but actually reduced their carbon emissions year-on-year without the use of offsetting." The offsetting industry has become a key player in the effort to reduce emissions. Businesses or individuals wanting to offset their emissions pay a third party, who then invests the money in clean energy projects or tree planting programmes. In theory, the payment ensures that the emissions are offset by an equivalent carbon saving. However, a number of schemes were criticised for failing to deliver on their promises. In response to these concerns, the UK government announced in July 2007 that it would establish a voluntary code of best practice in an attempt to improve confidence in the offsetting sector. But Harry Morrison, general manager of the Carbon Trust Standard, said that offsetting was not part of the benchmark. "We want businesses to focus on taking action themselves and reducing their own emissions," he told BBC News. He explained the standard was underpinned by three rules: measurement, management and reduction of the carbon footprint. "In order to pass the scheme, you need to have an actual numerical and quantified carbon footprint. "The second thing is that you need to be reducing the footprint over time," he added. "Management is important because it shows whether an organisation actually has the processes in place to drive the reductions over the coming years. "So we are looking to see that an organisation has the appropriate governance, senior management involvement, appropriate policies and good carbon accounting processes. "All of that has to happen in-house." Twelve organisations - six companies and six public bodies - have been awarded the Carbon Trust Standard to date, one of which is London Fire Brigade (LFB). Ian Shaw, the LFB's energy adviser, told BBC News the scheme would help the brigade meet its tough carbon reduction targets. "It shows that we are doing the right thing by getting an external tick in the box." He said the main challenge was reducing emissions from LFB buildings, which were responsible for the vast majority of the brigade's emissions. "We have 112 fire stations, ranging in age from 1887 to 2005; 30% of these are listed buildings." The Greater London Authority's Climate Change Action Plan requires the LFB to reduce its emissions by 60% by 2025. Mr Shaw admitted it was a tough target: "I think that's why it was set. If it was less, then it would be easy to achieve, whereas this one is going to take effort - as it should. "We have got to carry on with our investment in our energy efficiency programme," he said. "We are replacing a lot of light fittings at our fire stations, installing Combined Heat and Power (CHP), photovoltaics, solar heating and a few wind turbines." Once accredited, holders of the standard have to deliver year-on-year reductions in carbon emissions, said Mr Morrison. "We think it is the first scheme in the world that rewards companies that can demonstrate ongoing improvements. "It is true that this is robust, and it will become even more challenging for organisations, but we are living in a time where we have to keep driving down emissions."